Fig. 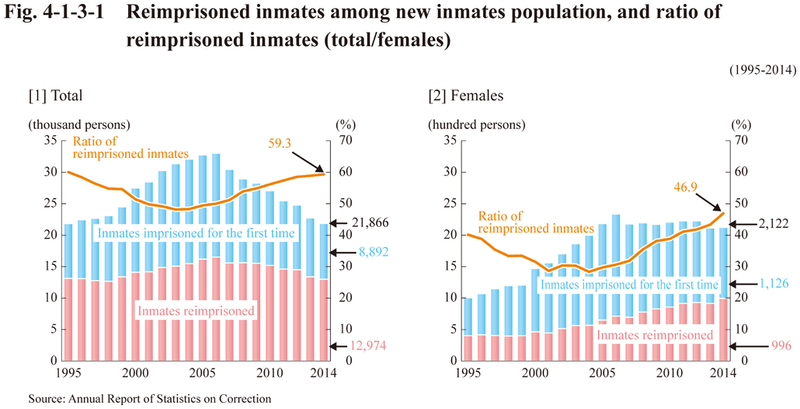 4-1-3-1 shows the number of inmates imprisoned for the first time, the number and the ratio of reimprisoned inmates (the ratio refers to the percentage of reimprisoned inmates among the total of new inmates). See Appendix 4-1 for the number of new inmates in 2014 by types of offense and the number of times they are imprisoned. See Appendix 4-2 for the number of reimprisoned inmates (males/females) by the types of offense. Also see Appendix 4-3 for the number of reimprisoned inmates by post-release intervals before they re-offend.